A dish washing machine is only as good as the detergent used in it. Dishwasher detergents come in 3 types powdered, gel, and packs. Powder detergents involve granules poured into the machine. They are usually inexpensive. However, they aren’t pre-measured and can, therefore, be easily spilled. Powder detergents are becoming less popular with time with most brands shifting to gel and pack form. Gels are liquid-like detergents that dissolve much quickly than their powdered partners. This makes them easier to rinse and are also better cleaners. On the other hand, they are also expensive. Packs or tablet detergents are the leaders in this niche. These are convenient to use than the gel or powdered types since they are pre-measured. Today, manufacturers are making the packs powerful by adding boosters, rinse aids, scents and other extras making them the most favoured. 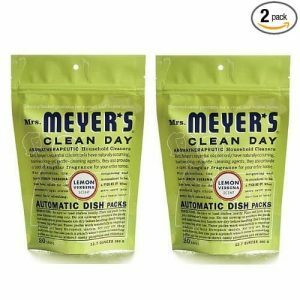 This dish washing detergent comes in several uplifting, fresh scents including lemon verbena, clean day, and basil. Just like most household products from this manufacturer, Mrs. Meyers Clean Automatic Detergent is derived from natural ingredients and doesn’t contain any phosphates or chlorine. Its packs are loaded with oxygen bleaching ingredients that will strike through grease and stains and leave the dishes sparkling and shiny. 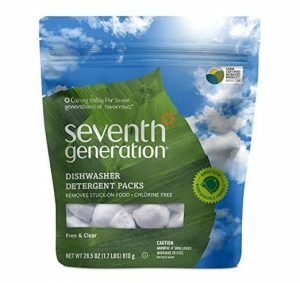 Seventh Generation is a USDA Certified dishwasher detergent with no chlorine or phosphates in its formulation. Most of its ingredients are obtained from essential oils and plants. Again, the tabs are thoughtfully packaged to prevent them from melting before use. The pacs have an all-in-one formula that will get your dishes not only streak-free but also free of all stains and thoroughly rinsed. Again, the pacs have been conveniently pre-measured to ensure a mess-free experience. 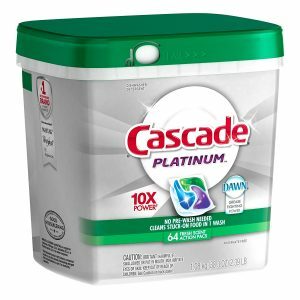 Cascade Platinum Dishwasher Detergent is today’s bestselling on Amazon. You’ll be surprised to learn that it’s also amongst those with a slightly higher price tag than other hastily formulated detergents. However, those who know quality know that it comes with a price. Some reviewers commented that its quality is far beyond its cost. It comes in convenient 64 packs with high cleaning power that doesn’t necessitate pre-washing your extremely dirty plates. Again, Cascade doesn’t leave any haze on your glasses. Its formula is also designed to make this detergent equally powerful even in hard water. Moreover, it will leave your dishwasher cleaner and smelling fresher. With the increased awareness of taking care of our Mother Nature, we all need products that are safe for us and those that won’t leave footprints on the globe. 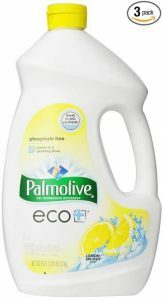 Through most dishwasher detergent brands have not been able to live to this, Palmolive is here to see that you get the best of each world. 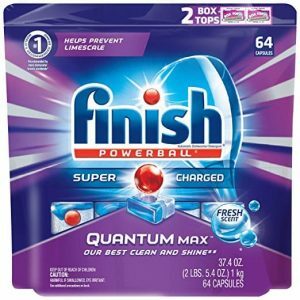 Their dishwasher detergent is phosphate-free and features a fresh and sweet lemon scent to leave you yearning for the next dish washing time. The bottles are ergonomically designed and have a decent spout to make pouring a breeze and waste-free. Are your dishes succumbing to stubborn stains like tea and coffee? Have you tried several detergents to no success? Worry not. 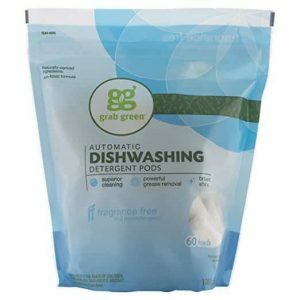 You should have been informed of these automatic dishwasher detergent pods when you purchased your dishwasher. These capsules dissolve super fast in water to leave your dishes sparkling clean and without any residues. You forgot to soak last night’s dishes, and the leftovers are stuck? Don’t bother. Finish Quantum is designed for those incidences. Again, this detergent’s formula has a Glass Protect Action that protects your glasses from any form of corrosion and redeposit. For close to 16 years, Method has been specializing in developing products that have almost zero negative impact on the environment. Consequently, their Method Smarty Dishwashing tablets can’t betray their efforts. 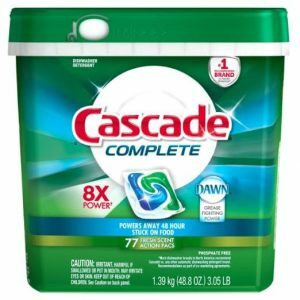 These tablets are loaded with triple-action power to get your dishes 3 times cleaner and residue free than other detergents. The Powergreen technology utilized by this detergent makes it efficient in both soft and hard water. 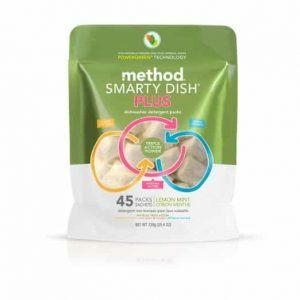 Remember, Method Smarty has no chlorine or phosphates in its formula. Grab Green believes that they don’t need to put your life on the line while trying to clean your dirty dishes. As such, they have thoughtfully formulated a better, safer, and efficient dishwasher detergent using naturally derived ingredients. Grab Green pods don’t contain chlorine, phosphates, dyes or any other chemically derived carcinogenic ingredient. Their packet will give clean 60 loads. These are fragrance-free though it also comes in the scented form with 4 great, natural fragrances to choose from. Ecover is not new to our ears. It has been around for some time cutting through grease and breaking through stuck-on foods to get you an amazing dish washing experience. Now, all that versatility and power has been made even better and stronger, and notably, without causing our planet any harm in any way. Everything about this detergent right from the packaging is biodegradable and safe for all lives. It has been packaged into 25 tablets for convenience. Again, they are all fragrance-free and don’t contain any dye or chlorine. Previous users have been left impressed and awed by how clean the dishes come out without any residue, grit leftovers, or haze. It’s the numerous positive reviews and high rating that attracted our attention to this dishwasher detergent. In fact, some reviewers and users reported that they would skip dish washing for up to 48 hours and still, the machine found no hard time. 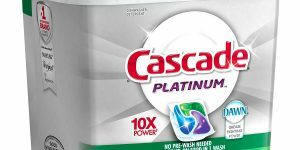 This dishwasher detergent is the most used in Northern America. It comes in different fresh scents and different packages. This package is enough for 77 fresh loads. It has Dawn in its formulation, a well-known grease fighter. It also has rinse aid action which will leave your dishes thoroughly rinsed, and free of any residues. You need not prewash or pre-soak your dishes before getting them into the dishwasher if you’re covered by these Powerball tabs. 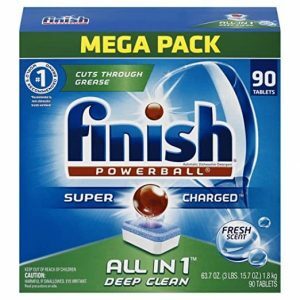 If you know how powerful the regular Finish dishwasher detergent is, now this Finish All in 1 is 3 times more concentrated. No wonder it was able to garner the highest rating and the most reviews. This detergent contains a bleach to make your tea and coffee stained dishes look like new. The tablets are again biodegradable and safe for your dishwasher and sewerage systems. While all we require is hassle-free dishwashing, going green should be our mission. As such, going for a detergent that’s phosphate, chlorine, and dye free will not only make our lives better but also protect other lives in our environment.